2 bed Town House is part of a small community on Islantilla Golf course, with large swimming pool and Paddle Tennis Court. Less than one hour’s drive from Faro airport and only 1 hour to Seville. Comprising a lounge, dining room, kitchen, including dishwasher, and laundry room with washing machine. Upstairs bathroom and downstairs toilet and shower room. The master bedroom has a balcony which overlooks the driving range. The house is furnished to a high standard to make it feel like home and with everything you need for a wonderful self catering holiday. The spacious living area has TV, DVD, and stereo/CD player and a patio with barbecue. All rooms have air condtioning/heating. There is underground parking. The house is a 5 minute drive to the beach, cafes, bars, restaurants, cinema and shops in the main commercial centre. Beaches: The coastline that runs the length of the Costa de la Luz region is magnificent with miles of sandy beaches. Many parts are backed by Pine tree forests and picnic areas. Because there is so much space you can just walk along the beach and have as much room as you want to spread your towels. And as naturism becomes ever more popular there is easy access for the naturist to drive 10 minutes down the road to the village of El Terron. There are plenty of golf courses either along the southern coast or across the bridge in Portugal. The property itself is wheelchair accessible although the main bedrooms are on the 1st floor. The lounge has a comfortable sofa bed and there is a walk-in shower room downstairs. The complex has its own Padel Tennis court. This looks like a mini tennis court with the addition of glass walls so is played as a cross between tennis and squash. Full air conditioning/heating. Great house with everything that you could need. A perfect home away from home in a truly Spanish location. 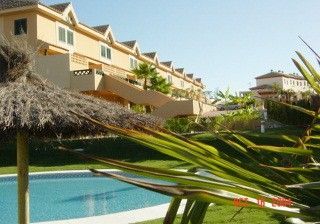 Beautiful beaches within walking distance though a car is advisable, and quiet pool. The owner was very helpful when booking. La zona es muy tranquila y la casa está correctamente equipada. La estancia ha sido muy agradable. Muy bien sobre todo la piscina. La estancia ha sido muy buena. La urbanización es tranquila y impia y vecinos respetuosos con silencio y zonas comunes. La casa según lo anunciado. La única pega el wifi. Por el precio del alojamiento debería tener wifi individual ya q el q tiene comunitario no estuvo disponible en toda la semana. I am sorry that the community WiFi was not available for you, I do not know why, but I will try and sort out for future guests. The house is in a quiet place with A/C in the bedrooms and living room. It is spacious and well equipped. When we arrived, the house wasn’t clean and we had to wait 24h for the cleaning. During our two weeks stay there was no other visit from the cleaning ladies. There was not a sun shutter in the balcony making impossible to have breakfast outside due to the strong sun. The washing machine wasn’t working properly and the front door wasn’t fully locking. The kitchen was equipped with dishes for 6-8 people and the dinner table had places for six people. You need a car to go to the beach or to the village centre. Overall, a good stay. Thank you for your review, I am pleased you enjoyed your stay in Islantilla. I am sorry that you had a few issues, I have spoken to my housekeeper about them, unfortunately you omitted to say in your review that the apartment was clean, but the terraces, due to heavy rain the previous day were very sandy, so really it was only the terraces which needed to be cleaned, the matter was dealt with the next morning, not as you said in 24hrs. The washing machine is not terribly efficient on a short wash, so washing has to be done on a longer wash. I am sorry there was no umbrella, if you had texted me or called my housekeeper this would have been sorted. Unfortunately the front door expands and contracts when there is excessive heat in the afternoon and so this affects the double locking of the door. Finally if you had wanted extra cleaning done during your stay, the best way would have been to contact my housekeeper to arrange this for you. I am sorry that you had these small issues, and I hope I have answered them for you. The Costa de la Luz is Spain's most south westerly coast, stretching from Gibraltar to the Portuguese border. The 'Coast of Light' is where the hustle and bustle of the other Spanish costas are left behind and the true, natural beauty of Spain shines through. Facing out into the Atlantic Ocean, you will find some of the most incredible beaches in Spain, with finer, whiter sands than their Mediterranean neighbours. Stretching almost the entire coastline, the beaches are typically framed by sand dunes and pine trees creating natural, rugged landscapes. With nature playing a key role in this corner of Spain, the Doñana National Park, boasts a wealth of flora and fauna, making it one of the largest and most interesting bird and wildlife sanctuaries in Europe.